This is the last installment in a series of posts delving into the results of FIRE’s “Speaking Freely” report on college students’ attitudes toward expression on American campuses. In this post, we highlight partisan differences in students’ attitudes toward campus guest speakers and disinvitations. 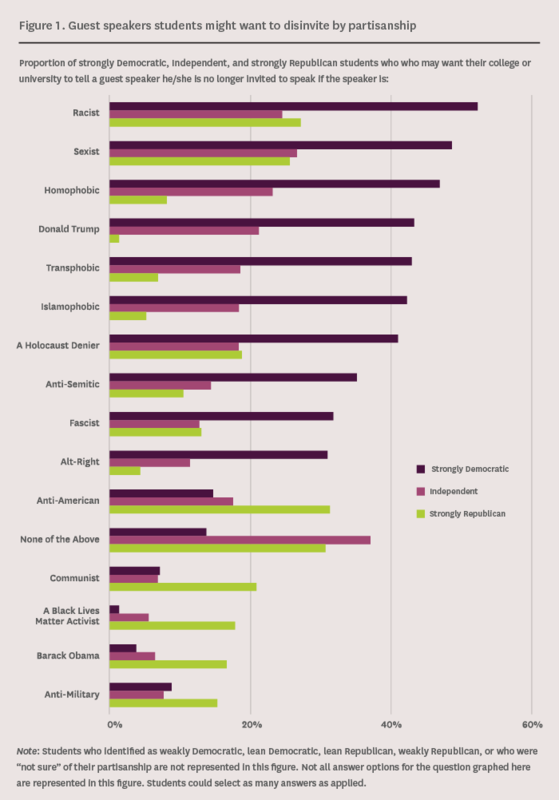 In 2016, Gallup, the Knight Foundation, and the Newseum Institute surveyed American adults and college students on their views toward freedom of expression. They found that support for the liberties protected by the First Amendment is strong among college students, and “partisan differences in views [toward] the security of First Amendment freedoms are relatively minor among college students.” For the first time, though, they found that although support is strong for these liberties, “students are willing to accept some limitations on free expression, particularly [expression] which is done to intentionally hurt or stereotype members of certain groups.” This finding is supported by additional evidence from a recent Huffington Post survey, and by FIRE’s own survey of college students’ attitudes. While analyzing data from our survey, we were interested to find out if there were partisan and ideological differences in students’ attitudes toward certain types of expression on campus, other than that which may be considered offensive or hurtful. We have posted about the evidence we found of partisan and ideological divides in students’ attitudes toward hate speech and self-expression on campus. In this post, we highlight the partisan divides in students’ attitudes toward the disinvitation of campus guest speakers, which we previously discussed in our “Speaking Freely” report. Additionally, as you can see in figure 1, the types of speakers that strongly Republican students might want their school to disinvite are different from the types of speakers that strongly Democratic and Independent students might want their schools to disinvite. Students across the political spectrum might want a racist or a sexist disinvited. But strongly Republican speakers also might want their school to disinvite an anti-American speaker (31 percent) or an abortion provider (30 percent), and strongly Democratic students might want their school to disinvite a homophobic speaker (47 percent) or President Trump (43 percent). Interestingly, more Independent students (37 percent) than their strongly Republican (31 percent) or strongly Democratic peers (14 percent) said that they would not want their school to disinvite a speaker. More Independent students (68 percent) also agree to having changed an attitude or opinion about an issue after listening to a guest speaker, than their strongly Republican (50 percent) or strongly Democratic (66 percent) peers. Thank you so much for following our series of Newsdesk posts on FIRE’s “Speaking Freely” report.